On my way to the opening of Corin Raymond’s Bookworm, I started thinking about my relationship to books. You see, I’m a non-fiction reader. I have read hundreds of academic articles and news clippings. I’ve read biographies, natural sciences books and social science books. I mean, I was even named after a news reporter. When the show started and Corin Raymond began mentioning all these books I had never read, my heart sank. Was I going to understand the literary references? How was I going to write a review? My worries didn’t last long. With an impeccable delivery Raymond shared story after story from his life. And while Bookworm is about books, the show centered on Raymond’s relationship with his father. Listening to how Raymond’s father used his love of books to parent, I was reminded of the beauty of people connecting with each other through shared passions. I suggest you check out Bookworm. Raymond’s way of connecting with the audience is remarkable, and he will generously share his prized personal and fictional stories with you. I admit my focus started to drift about three quarters of the way through the show, but the final twist drew me back in. By the end of the performance there were a few tears in the audience. I highly recommend Bookworm. To learn more about performer and singer-songwriter Corin Raymond listen to the interview below. Corin spoke with me on the phone about his experience creating Bookworm and performing across Canada. 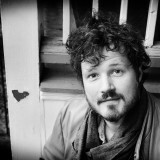 To find out more about Corin’s music and theatre performances, visit www.dontspendithoney.com.